UKIP, shorn of its most high-profile campaigner Robert Kilroy-Silk, has lost its deposits in at least 451 seats - costing it about £225,500. It was a long way from the 16.1% of the vote it won in last year's European elections, when it took 12 seats. Even its leader, the former Tory MP Roger Knapman, could only poll 3,914 votes (7.74%) in Totnes, Devon. He trailed in a long way behind the winner, Conservative Anthony Steen, Labour and the Lib Dems. Only last week Mr Knapman claimed the party was doing well in its 21 target seats and was hopeful of winning at least one - Totnes or Thanet South. Spokesman Quentin Williamson said Mr Knapman's leadership was not in doubt and he would serve his full four-year term. He added: "It is disappointing though. We had expected to do better." Since doing so well in last year's European elections, UKIP has been dogged by in-fighting. 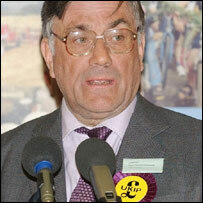 Former BBC presenter Mr Kilroy-Silk failed in a bid for the party leadership and promptly left to form his own party, claiming UKIP had no policies other than its demand for Britain to leave the European Union. The party had claimed one of its best results would come in the Thanet constituency in Kent, with Mr Knapman predicting that their candidate, Euro MP Nigel Farage, would get 20%. But he fell short on the night, recording only 2,079 votes (5.04%). UKIP spokesman Piers Merchant, a former Tory MP, told the BBC: "Our vote is considerably up on the last general election and that is important. "Rome wasn't built in a day and we were not expecting to go into government today." Earlier in the week UKIP had threatened to take action to force an election re-run in the marginal seat of Somerton and Frome because of what it said was a misleading Conservative election leaflet. In the event the Tory candidate failed to unseat the Lib Dems' David Heath and the UKIP man only recorded 1,047 votes (1.94%). The party benefited from the European Parliament's voting system of proportional representation in last year's elections. And it admits Mr Kilroy-Silk was "an asset at the time", but points out his breakaway party Veritas also failed to make an impact. Mr Kilroy-Silk, contesting the Derbyshire constituency of Erewash, came in fourth behind Labour, the Conservatives and the Lib Dems. He recorded nearly 3,000 votes (5.85%) but won a victory of sorts, handily beating the UKIP candidate who got only 941 votes (1.86%).